Dungarees are a some what controversial fashion item. A bit like Marmite: you either love them or you hate them. I most definitely love them and in actual fact have lived in mine the past few weeks. They are great paired with a trainer for an everyday casual look but can also be layered over a comfy knit which we all certainly need right about now. Worried about dressing your dungarees up? Just pair yours with a v-neck tee or white shirt and a pair of stilettos and you have yourself a pretty cool alternative to the LBD. This particular pair of dungarees are from New Look and an absolute steal at £26.99! A word of warning, these dungarees are a little on the snug side so I would suggest sizing up. I'm usually an 8 but went for a size 10 in these (that or I had a little too much indulgence over the festive period). I sure do hope it's the former and not the latter. 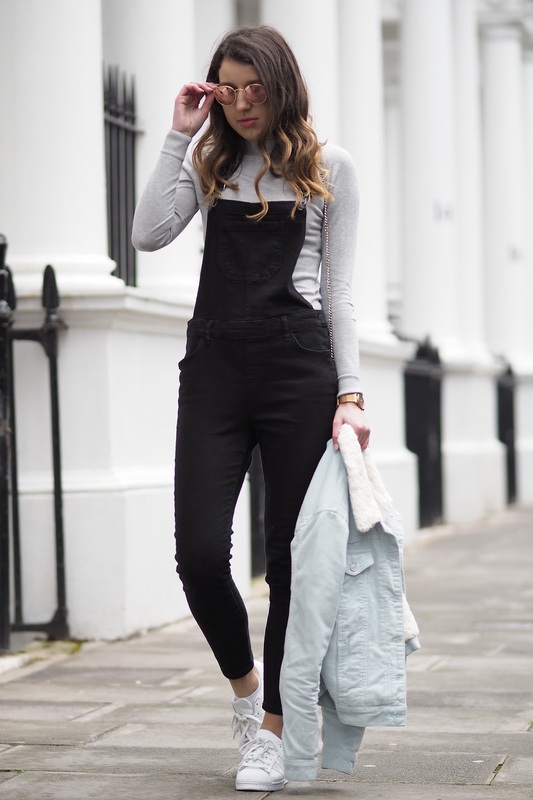 Are you a fan of dungarees? Why not invest in a black pair to see you through to the summer months where you can then switch to a lighter denim shade. I love dungarees too and find them a good alternative to just wearing jeans. I, too, love dungarees! I have a pair that I absolutely love wearing during this time of year and they're fairly easy to transition into the warmer months too! I always worked in more formal organizations before, with a straight dress code. So my closed always was full of formal skirts and shirts. But not long time ago I changed my job and now I'm working at https://classyessay.com/samples and I don't need to dress formal anymore. This is a problem for me. I don't know what is popular today and I can't find my style yet! Your blog is helping me to dress well and to know all major tendencies in fashion. Thank you very much!